Asphalt Solutions specializes in asphalt repair. With our infrared unit, we are capable of completing repairs up to a full 13' width or an entire lane width. This option is beneficial for private, county, and state highway roads, as we can repair potholes, frost heaves, expansion joints, and other common problem areas without the expense of having to repave the entire section of road. Infrared technology is the most cost-effective way to repair and maintain roads so contact us today in Frankfort, Michigan, to have your roads restored. Infrared repair is a method of blending new asphalt with infrared-heated existing asphalt to create a seamless repair. The infrared equipment is capable of heating existing asphalt to a depth of approximately 3". There is no direct flame in contact with the existing asphalt during the heating process. Therefore, no oxidation or burning occurs. There are many different applications where infrared technology can be used, such as frost heaves, railroad crossings, potholes, deteriorated shoulders and radii, storm drains, and many other problem areas. Infrared repairs are permanent, seamless, and cost-effective and match existing asphalt better than any other method. The entire process takes approximately 30 to 45 minutes and can be driven on almost immediately. Cost: Infrared repairs are usually 50% less expensive than conventional repairs. Time: The entire process only takes 30 to 45 minutes and can be driven on almost immediately. The old method of saw cutting, removing, and repaving can take several hours to days to complete. Convenience: Repairs can be completed at any time. Scheduling work to be completed during non-busy hours will help reduce traffic problems, liability, and general distractions. 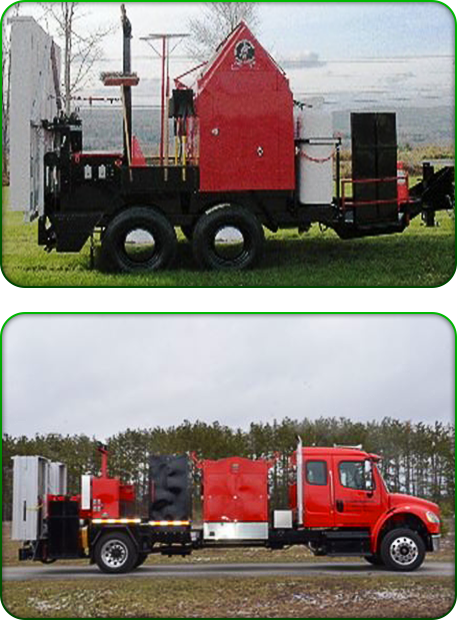 Our truck is capable of better heat penetration, is easy to maneuver, and is fully self-contained. We have a Bobcat-mounted unit that can repair trails, bike lanes, and golf cart pathways. We can repair these surfaces while maintaining their beauty.